MGB 1962 -1980 Weber Carburetor Conversion Kit. This Redline kit contains a Genuineish made Electric Choke Weber Carb. W/hardware and instructions for installation. These these are actual pictures of the kit. THE DGEV SERIES WEBER CARB. Any search for the ideal 2-barrel, progressive down-draft carburetor would surely end with the DGEV Series. Look no further for versatility, wide adaptability, easy installation, low initial cost, trouble-free maintenance, excellent drivability, increased fuel economy and improved performance. Designed for engines displacing 1200cc-2600cc, the DGEV Series carbs feature diaphragm type accelerator pump circuits and models with manual, water or electric choke actuation. The DGEV also has a power valve circuit to facilitate low vacuum running conditions. The Kits utilizing the 32/36 Progressives Weber are designed to provide the market with an economical performance carburetor conversion that while increasing Hp also improves drivability and fuel economy over the stock carburetor. The kits using the 32/36 progressive carburetor is the optimum carburetor for use as a replacement carburetor for a worn out or hard to maintain factory carb. Weber Carbs distributed by REDLINE. K&N Oil and Cleaner for Air Filter. Gaskets for all Weber Carbs. Jets for all Weber Carbs. Linkage kits for installing Weber's. Adapter Plates for installing Weber's. Cannon & Offenhauser Intake Manifolds. 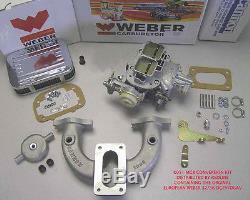 CARBURETOR CONVERSION KIT W/GENUINE WEBER CARB. This Redline kit contains the following. (1) 32/36 DGEV Genuineish WEBER Carburetor - electric choke (1) New Cannon intake manifold w/hardware (water heated manifold) (1) Linkage Kit for the accelerator cable. (1) Air filter assembly with washable/cleanable element (1) Instructions. The WEBER conversions by Redline are unique in many ways. Redline was the first and is still the best conversion available. Proprietary changes to the jetting allow for flawless performance. Tuning and jetting from the leader in WEBER conversions - REDLINE. Factory Direct Pricing and Product Support. 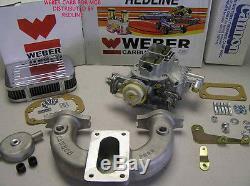 Largest selection of WEBER Carbs and parts. We sell only GENUINE EUROPEAN WEBER carbs - no substitutions. Beware of Chinese made and "NorthAmericanWebers" -they may look the same - but they are. The Redline kits contain only the Genuine Weber from Europe- designed in Italy and made in Spain. Here is a link that really explains it well. (for replacement of stock twin SU carbs). (for replacement of zenith-stromberg carb). Requires replacement of stock exhaust manifold with an earlier manifold or with a header. Will also fit the 1973 - 1975 Austin Marina. REDLINE PART NUMBER K051 - NOT LEGAL FOR USE IN CALIFORNIA. Vehicles with AC and or Cruise may required additional modifications that are not available in this kit. Fabrication or reuse of original parts may be needed to allow the AC or cruise to work. Automatic transmission vehicles may require additional use of factory linkage for proper operation. Before ordering make sure to check with your state regarding emission laws. Legendary marques like Alfa Romeo, Aston Martin, Ferrari, Lamborghini and Maserati have been closely linked with the products of the equally legendary Edorado Weber S. Of more than 50 years. While various producers of racing and high performance induction systems have moved in and out of the limelight over many decades, Weber alone maintains its worldwide superiority. The foundation of Weber's supremacy is no mystery. It's nothing more than the traditional virtues of careful design, meticulous manufacturing standards and uncompromising quality control, coupled with that unique Italian attribute of elegance in design. Do not confuse this with Weber North America - not the same company. Weber North America brands various carburetors as "WEBER's" but they are NOT the European WEBER. REDLINE uses exclusively the European WEBER carburetors in their conversions. The Original Engineered and designed 32/36 DGEV series WEBER carb is often copied, sometimes licensed - but there is only one original. The price of perfection is being admired to the point of being copied (EMPI - made in China) or creating the appearance of being a DGEV when you are not. Get the perfect carb for your conversion - a 32/36 DGEV from Redline. Sometimes it is tough to improve on the original - and the 32/36 DGEV was the first and is still the benchmark by which all 2 bbl carburetors are measured. The Import Experts are not responsible for its products when subjected to abuse, improper installation, accident or normal wear. We have an expert team of technical advisors to help in the rare occurrence of problem. Our family business was started in 1921. We sell only high quality replacement parts for cars, trucks and SUV's. We have changed with the times and persevered. The bitterness of poor quality remains long after. The sweetness of low price is forgotten. The item "Weber conversion kit withElectric choke Weber carb fits MG MGB 1962-1974" is in sale since Tuesday, January 26, 2016. This item is in the category "eBay Motors\Parts & Accessories\Car & Truck Parts\Air Intake & Fuel Delivery\Carburetors". The seller is "allautomotive" and is located in Los Angeles, California. This item can be shipped to United States, Canada, United Kingdom, Denmark, Romania, Slovakia, Bulgaria, Czech republic, Finland, Hungary, Latvia, Lithuania, Malta, Estonia, Australia, Greece, Portugal, Cyprus, Slovenia, Japan, China, Sweden, South Korea, Indonesia, Taiwan, South africa, Thailand, Belgium, France, Hong Kong, Ireland, Netherlands, Poland, Spain, Italy, Germany, Austria, Israel, Mexico, New Zealand, Philippines, Singapore, Switzerland, Norway, Saudi arabia, Ukraine, United arab emirates, Qatar, Kuwait, Bahrain, Croatia, Malaysia, Brazil, Chile, Colombia, Costa rica, Panama, Trinidad and tobago, Guatemala, Honduras, Jamaica.